In a previous post we described sediment control basics and the importance of understanding some basic principles in order to make better sediment control choices. The same is true for erosion control. In other words, let’s not waste money on control measures that don’t work! Better understanding of erosion control principles equates to reduced erosion and smarter use of your budget. Much of our Clean Water Act legislation and related State and local stormwater regulations are focused on reducing sediment in our waterways. Sediment is soil particles that have been dislocated by wind or rain or surface runoff and are at risk of ending (eventually) in our shared waterways. 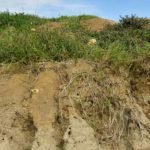 Erosion control is the use of design choices, control measures, and practices that will keep soil in its place before it becomes a sediment problem. In contrast to sediment control which is reactive, responding to soil already in motion, erosion control is proactive and keeps soil in its place with preventive measures, or erosion control. 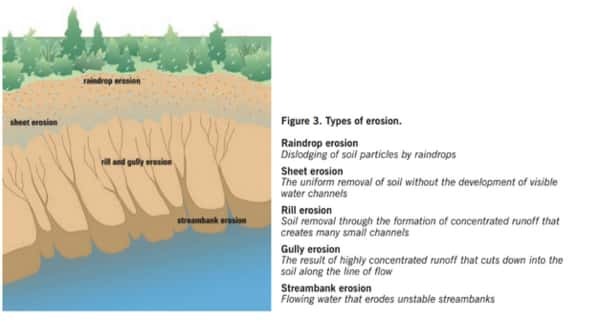 Erosion is the displacement of soil particles and there are two principle mechanisms that cause erosion. First is droplet impact. When a rain drop impacts the ground it may appear small, but it is enough to cause soil particles to dislodge. Multiply times millions of rain drops and you have a level of force that can cause significant amounts of soil to be mobilized. The second mechanism is surface water movement over the ground which essentially scours soil particles, dislodging them with the horizontal force of movement over the ground. Where surface flows are concentrated, as in a channel or gulley, or accelerated by a steeper grade, the erosive force increases greatly. Rainfall that lands on forested areas, meadows, or turf areas has less erosive power because the plants absorb the impact force and impede the flow of water over ground. The combined effect greatly reduced the erosive potential of a rain event. 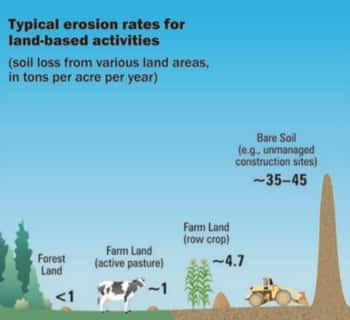 At construction sites, the first significant action is to strip vegetation and topsoil, so during the course of construction there is an increased potential for erosion and sedimentation. 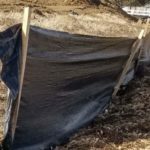 Erosion control measures are meant to stabilize the soil surface, either temporarily during construction, or permanently as the construction activities wrap up and long term stabilization is needed. Effective erosion control will greatly reduce the amount of sediment that is being transported in surface water from precipitation. To the extent that we can protect soil from the effects of erosion, we will have far less material to attempt to control down slope. So although the typical construction site will have limited areas which are available to implement erosion control, it is very effective to implement erosion control measures as soon as possible, which lessens the amount of sediment flowing down slope to channels, streets, or project perimeters. We are talking basics here, so at the risk of stating the obvious, few construction sites can be managed solely with sediment control measures, and even fewer can be managed with only erosion control measures. 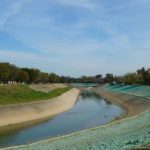 The trick in most cases is to balance the use of both erosion and sediment control to effectively limit the risk of pollutants having an impact off site from our work areas. The particular combination of erosion and sediment control will change as a project transitions from mass grading, to going vertical, to final stabilization. But, whatever control measure is used, the use of both sediment control and erosion control creates redundancy so that we are not relying on a single measure. And often the erosion control measures are implemented upstream (literally and figuratively). This means the design is more focused on prevention of erosion, and this proactive stance will reduce the sediment load we need to factor into our designs at the site. Benjamin Franklin has reminded us that an ounce of prevention is worth a pound of cure. In our search for smart erosion and sediment control design, the ability to prevent erosion and therefore limit the amount of sediment we need to manage is the ounce of prevention we are looking for. This is not to say that erosion control measures are always less expensive than sediment control measures, but effective erosion control allows us to use less sediment control and spend less on maintenance. Look for a follow up post to describe some of the most common erosion control measures found on construction sites.